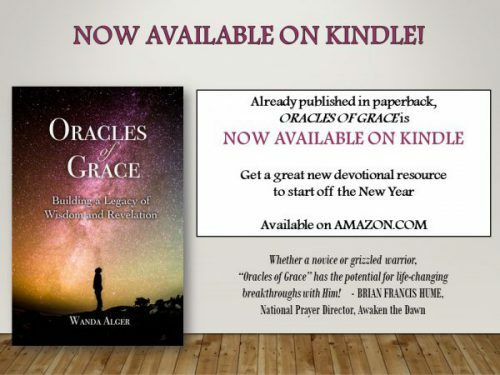 For those of you who like to use your devices to read your daily devotions, you can go directly to Kindle and download ORACLES OF GRACE by CLICKING HERE. I am currently on a 21-Day Fast and am off Facebook and social media for a while (for those who follow me on Facebook, these blogs automatically post to Facebook). It is quite a change, but a welcome one! Though I love to interact on Facebook and have been blessed by all my new Friends in 2017 (almost 1,000! ), I knew I needed to take a break. I find it challenging to maintain my own focus and “edge” when I keep looking at what everyone else is doing or saying:-). I have so appreciated hearing from some of you who have written to let me know you are encouraged by my writings and are praying for me! Those comments are gold. Thank you so much, especially for the comments at the end of each article. I read every one of them! BE YOU! In looking ahead to the new year, I believe we all have a desire to be significant and make a difference in people’s lives. I also believe that each of us has a unique part to play and we can’t afford to waste time by comparing ourselves with others. I believe that’s the biggest temptation in social media – comparing ourselves with one another and losing our way on the path God has for us. I encourage you to be YOU and stay true to your own heart and path. We are each called to something special and have a role to play that NO ONE ELSE can play. This is an important principle to apply when discerning what the Lord is calling you to do in any season. You must consider what it is that only YOU can do. Know the grace that God has given you and celebrate it without apology! FINISH AND COMPLETE. I believe we have a window of time to “get ready” for the glory of God that is going to come like a wave upon the earth. Just as a pregnant mother-to-be has a “nesting instinct” in preparing for her newborn, so I believe the Lord is “brooding” in the hearts of many believers who are watching in prayer and expectant of the “new thing” God is about to do. It is in this season that we must pay attention to the things that must be FINISHED and COMPLETED. Our spiritual foundations must be secure, our houses must be in order, and our relationships healthy. We must be connected to the family of God through a local fellowship and know that we BELONG somewhere. This is all a part of the alignment that has been prophesied. It is only when our hearts, minds, relationships, and daily habits are IN LINE with God’s desires and purposes that the fullest release of God’s Spirit can flow. For me personally, the Lord is not allowing me to go into any new territory – spiritually speaking – until I complete some of the assignments He has already given me. Some of this has to do with some more books I am to write this year, as well as finishing some other ministry projects I’ve started. I believe this is happening to others, as well. There are some projects, initiatives, assignments, and even relationships that the Lord has called you to in the past, but you haven’t followed through on them. You may even feel stuck and wonder why you’re not going anywhere. It may be because He is waiting for you to do the LAST THING He told you:-). It is not a rebuke, but a reminder that He has called and equipped you to do something that only you can do, and without it, a piece of a bigger puzzle will be missing. Your assignment is significant! You are a piece of a bigger puzzle! You may not see it now, but HE does. Finish what it is you’ve started and complete the work He’s already given. There is a window of time for this, so don’t put it off. “So teach us to number our days that we may get a heart of wisdom” (Psalm 90:12 ESV). GET HEALTHY RELATIONSHIPS. There is a lot of clean-up happening in our nation and in the church right now. This will continue for at least another year or two. However, we cannot be side-tracked by the mess. We must keep our focus and be sure that we are doing our part in CLEARING THE WAY for an increase of Kingdom expansion. It starts at home. FAMILY is the center and core from which kingdom values and practices flow. We must allow the Holy Spirit to do His work in sanctifying and purifying our lives, as well as our relationships with one another. DO NOT FEAR THE UNKNOWN. Various doctrines of the end-times are going to cause division within the Church in the coming days. There are already rumblings of this happening in social media. We must guard our hearts in this and not allow WHAT WE DO NOT KNOW FOR CERTAIN to divide and conquer us. I personally believe the Lord is more focused on US as His sons and daughters than He is on a cosmic time-table of events. The main factor that keeps these arguments alive is usually a FEAR OF THE UNKNOWN. In our attempts to calm our fears, we try to figure out what’s going to happen next. Give it up (I say with a smile)! “But concerning that day and hour no one knows, not even the angels of heaven, nor the Son, but the Father only” (Matthew 24:26 ESV). I can tell you that there is NOTHING to fear and EVERYTHING to anticipate (Daniel 7:18). God’s kingdom never decreases and His purposes never fail. He is preparing His Bride as a glorious Church who walks in power and purity. That’s something to rejoice in! Finish what was started. Secure your foundations. Embrace your family. Allow this “nesting” period to compel you to complete that which only you can do. A new season is almost here and we need to be ready in order to fully engage with it and celebrate His glory! “And to Him was given dominion and glory and a kingdom, that all peoples, nations, and languages should serve Him; His dominion is an everlasting dominion, which shall not pass away, and His kingdom one that shall not be destroyed” (Daniel 7:14 ESV). I so agree with you. I see so much of what you are sharing happening now. Some in my life. Thank you for sharing. It is always inspiring.